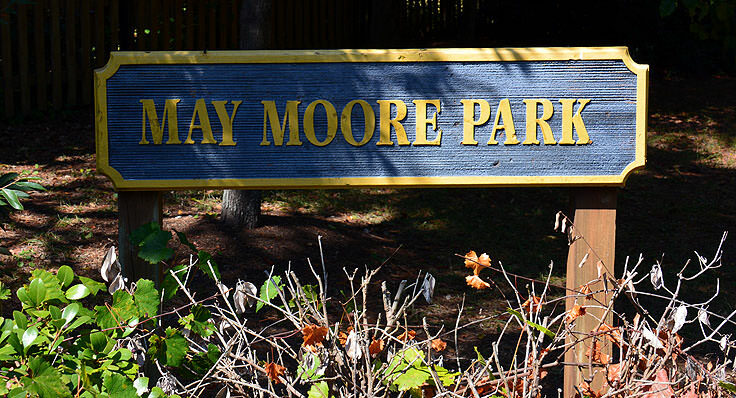 Take a break from the beach and enjoy the winding canals and creeks that border the Elizabeth and Cape Fear Rivers with a visit to the May Moore Park. This small destination, located on the northeastern side of Oak Island, is within walking distance of a number of vacation rentals, and provides plenty of peace and quiet for beach lovers who want to try a different natural excursion off the salty Atlantic shoreline. The park is relatively isolated and secluded, and for good reason. 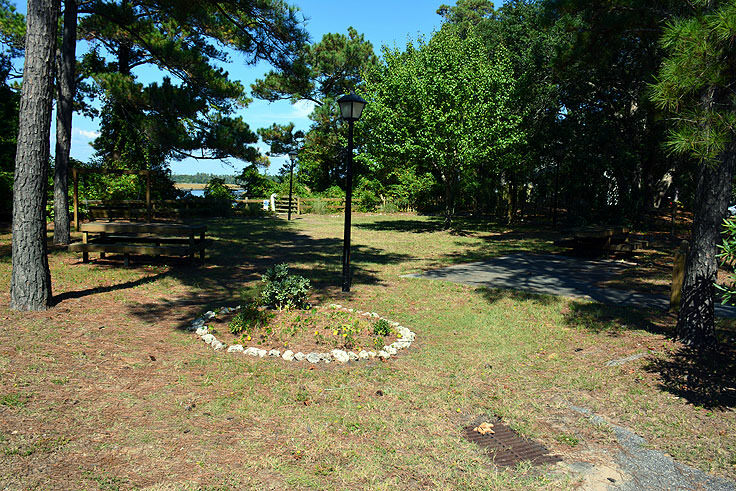 Located on the corner of Elizabeth Drive and Barbee Drive, and taking up just a couple of residential lots in area, the park is relatively undiscovered by the majority of Oak Island visitors. The park is also a good four blocks away from the beach scene, and as a result, is a natural waterfront paradise of a different kind with shaded terrain and unlimited privacy. Swings are available at the park for young visitors, and the majority of the park is covered by towering oaks, cedars, and yaupons which provide plenty of shade for lounging park patrons. Not very large and with limited facilities, May Moore Park is a good spot for a game of Frisbee, a quick round of catch, or a little leisurely stroll off the sand. 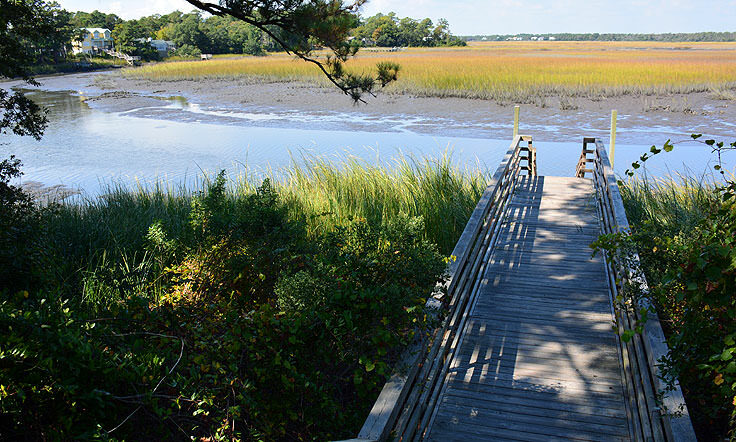 The big draw of this park, however, is along the waterfront, as a wooden boardwalk extends into the water leading out to a landing overlooking the canal, marshes, and estuaries of the Elizabeth River. The locale is very popular with anglers in the know, as from the small dock fishermen can reel in shrimp, small mullets, sheepshead and bait fish, essentially accumulating an arsenal of bait that is ideal for a full day of fishing along the beach, or from one of the island's two piers. The dock is also a good spot for "hand line" crabbing, where anglers can dip a small fishing line or string with a piece of chicken or other bait into the water, and slowly reel in the crabs that come biting before scooping them up with a hand net.Essentially, the small dock at May Moore Park is a great place for seasoned anglers to try a new form of fishing or collect bait, and for new or young anglers to get their lines wet with a little gentle practice. The May Moore Park, and especially the waterfront boardwalk and dock, are also a popular destination for seasoned birdwatchers, as a number of varying migrating and permanent shorebirds can be spotted along the wide open stretches of saltwater canals and marshlands. Osprey, ibises, egrets, pelicans, Canadian geese, and even Great Blue herons all make frequent seasonal visits to this northern portion of Oak Island, and bird lovers are advised to bring along a guide book and a camera to keep track of all the innumerable sightings. 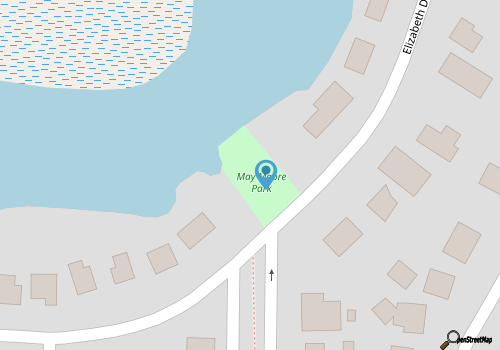 Though small and fairly hard to find amidst the neighborhoods of residential and vacation homes, the May Moore Park is a gem of a destination for water lovers. Located a good walk away from the Atlantic Ocean, but featuring exceptional fishing, bird watching, and incredible views of Oak Island's marshy and naturally wild terrain, this park will surely make visitors fall in love with all of the Brunswick Beaches' notablebodies of water.